(CNN) -- A 41-year-old man was charged Thursday with murder and other charges in connection with the deaths of two British soldiers at a base in Massereene, Northern Ireland, earlier this month, police said. 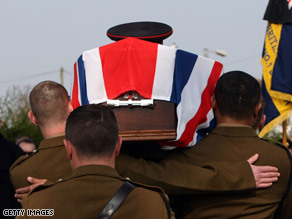 Comrades carry the coffin of sapper Mark Quinsey in Birmingham, England, on March 18. The man, who was not named, was charged with two counts of murder, five counts of attempted murder and a single count of possession of a firearm and ammunition with intent to kill, police said. He was expected to appear in court Friday morning. The 41-year-old man was one of six suspected dissident republicans whose lawyers successfully challenged a court order granting detectives more time to question them in the case, British news reports said. The group was released without charge on instructions from a judge, a police spokeswoman said, but the 41-year-old was quickly re-arrested. The base shooting was the first fatal attack on British soldiers in Northern Ireland in more than 12 years, and it sparked fears of a return to the sectarian violence -- a period known as the Troubles -- that Northern Ireland suffered until the Good Friday Agreement of 1998. Cengiz "Pat" Azimkar, 21, and Mark Quinsey, 23, were killed in the attack, which came as pizzas were being delivered to the base barracks. Two other soldiers and two pizza delivery men were wounded. The Real IRA, a militant splinter group of the Irish Republican Army, reportedly claimed it had carried out the attack. Earlier, a 21-year-old man appeared in court in Belfast, Northern Ireland, charged in connection with the murder of a police officer two days after the fatal attack on the soldiers, police said. The man, who was not named, was charged with withholding information in connection with the murder, said the Police Service of Northern Ireland. He is the third person charged in connection with the shooting death of Constable Stephen Carroll, 48, on March 9. The other two men, 37 and 17, have been charged with his murder, police said. Four others have been released in the case. Carroll was killed as he responded to a call in the town of Craigavon, in County Armagh. News reports said he was shot in the back of the head. Another militant splinter group, the Continuity IRA claimed responsibility for Carroll's killing. Neither splinter group accepts the Good Friday accord that ended direct London rule of Northern Ireland and created a power-sharing government.